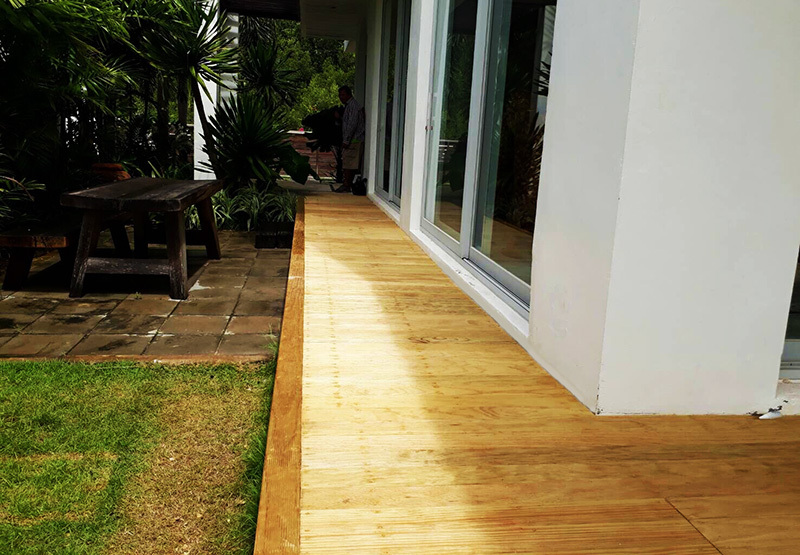 New Zealand Pine Wood Decking in Thailand …. The Thai Garden Design team visited a property on the coast of Kuiburi, Prauchuap Khiri Kahn, to investigate a failing timber decking. The advice from the customer was they would like it replaced with something aesthetic and strong, so after discussions the team recommended a beautiful New Zealand Pine Wood Decking. The New Zealand Pine can come as either smooth or grooved (non-slip), and has a beautiful natural grain and colour, even in grooved form this is clearly present. The team got to work removing the old structure, and renewed all the supporting foundation wood. All wood including support and top deck was treated with teak oil. A Super Looking, Finished Pine Deck …. The finished pine decking is a sight to behold… A wonderful natural yellow colour, the team also inbuilt a large hatch giving access to the pool pump below. A neat border encloses the top deck, with side cladding along the raised terrace. The owners were especially pleased with the final decking. All old unwanted debris was removed from site, and the garden was also given a quick make over by the Thai Garden Design team. If you want to improve your outdoor space in Thailand, you’ve found us! Contact Thai Garden Design for a friendly chat about your ideas and requirements.